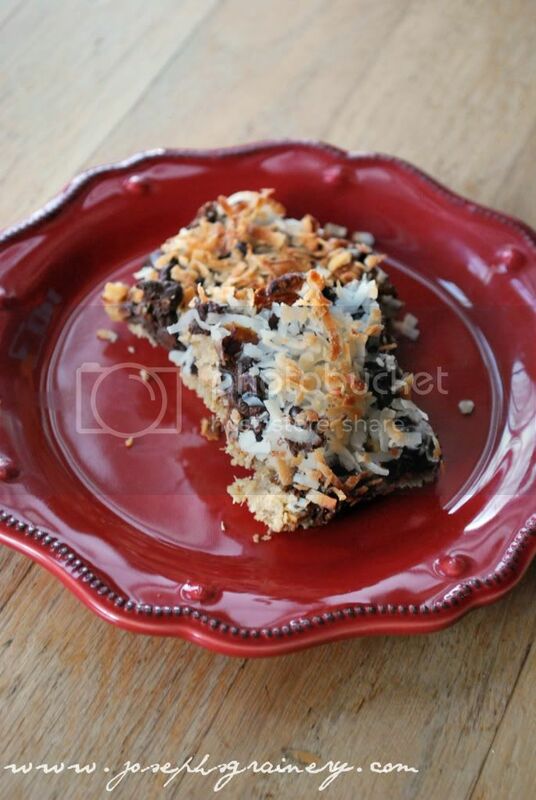 If you like coconut, if you like chocolate and especially if you like the two paired together, then you're in for one sweet treat with these Chocolate Coconut Bars! MaMa made these and I think DaDa and I had the pan devoured by the end of the evening. We do that from time to time with MaMa's kitchen creations. After a weekend of parties...two baby showers and a birthday party to be exact, we decided we needed to keep the party going, by featuring this delicious little dessert. MaMa liked it served up with warm caramel sauce over it. Me, I liked it straight out of the pan! Directions: Preheat your oven to 375 degrees. Prepare a 9x13 baking dish with cooking spray. In a food processor, pulse together the butter, sugar, flour and salt until the mixture resembles a coarse meal. Add the oats and pulse until just combined. Press this dough evenly into the bottom of the 9x13 and bake for about 20 minutes, or until lightly browned and firm. Scatter the chocolate chips and raisins on top of the crust. Drizzle the condensed milk and top with coconut. Bake until coconut is golden, about 20 minutes. Let cool completely in dish before cutting. This recipe was adapted from one found in the latest issue of Martha Stewart's Everyday Food .